Julian and I had landed at Leh in Ladakh, over 3,500m up on a plateau in northern India and close to the Pakistani border, which is why International roaming is not allowed. 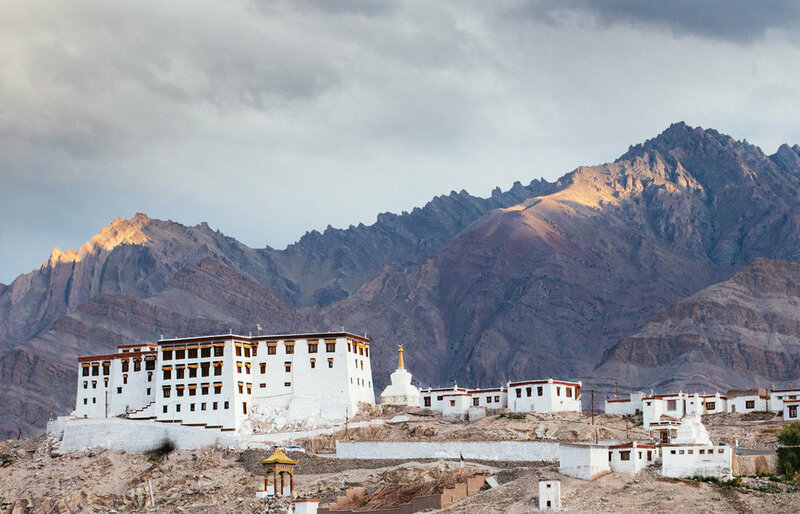 But despite being part of India, Ladakh is culturally more akin to Tibet and has some of the oldest Buddhist sects in the world. Everywhere you look prayer flags are strung up like bunting and monasteries adorn hillsides. Ladakh comprises 45,000 square kilometres of high altitude desert with thin, dry air, deep rugged valleys and surging rivers. 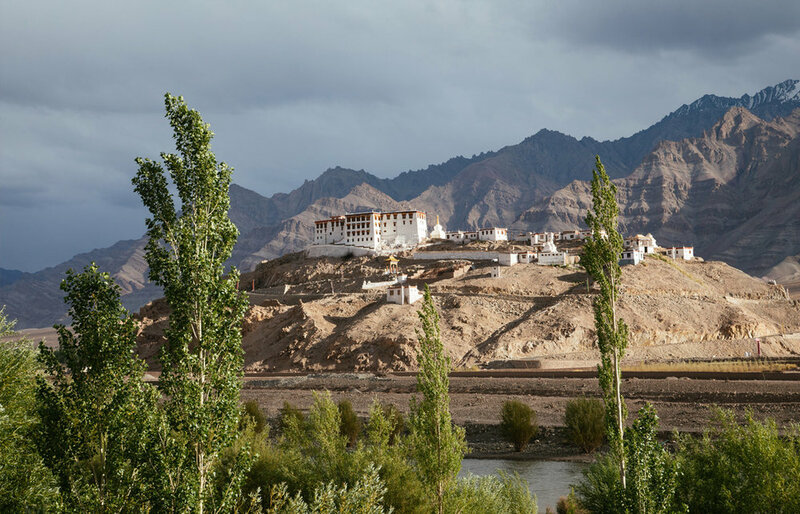 It is a starkly beautiful place, but every so often, cradled between the jagged peaks and barren ridges of four mountain ranges (the Great Himalaya, the Zanskar, the Ladakh and the Karakoram), you will discover a carpet of emerald green housing fertile villages. For two weeks Julian and I did a combination of a four night tented trek high into the mountains (more on that next month), as well as staying in traditional houses in three local villages. Our immersion into Ladakh’s landscapes and culture was aided by our excellent guide, Bhim. The houses we stayed in were locally owned and built in the traditional Ladakhi way using sun baked mud bricks and wooden beams made of local poplar and willow. The owners live downstairs, whilst the upstairs has been sympathetically but beautifully renovated. The houses are in stunning locations, but each has its own character and charm, albeit all come with the same modern touches: huge comfortable beds, gorgeous linens, proper showers, comfortable lounges and fabulous food cooked by talented chefs served up by candle light in traditional Ladakhi kitchens or in various scenic spots in the surrounding area. The house is yours for the duration of your stay, whether it’s just the two of you (like me and Julian) or a family of 8. You share it with no one other than the local family downstairs and the amazing team that look after you. On arrival in Ladakh we headed to the small village of Nimoo and our first house. At 2,800m it was a good place for us to acclimatise. We were ordered to rest on our first day and so sat on the roof terrace soaking up the stunning views across the Indus River. Taking a stroll around the village, we were warmly greeted by the locals with a “Julley”. This lady was happy for me to take her picture, but only after she had done her hair. The next day we visited what was left of the red mud brick fortress at Basgo which, together with its monastery, teeters on the edge of a hillside. That afternoon, from the stunning setting of Likir Monastery dominated by a huge golden Buddha, we mounted our bikes for a breathless uphill slog before freewheeling back to our house in Nimoo. The most remote house we stayed at was in the small village of Egoo, twenty five minutes up in the hills off the main highway. Village life was stripped back and simple. Children played outside, whilst the parents tended their land. Despite being the most peaceful place I had ever stayed, the owner of our house decided to live in the nearby hermitage, but was eager to greet us when we visited. 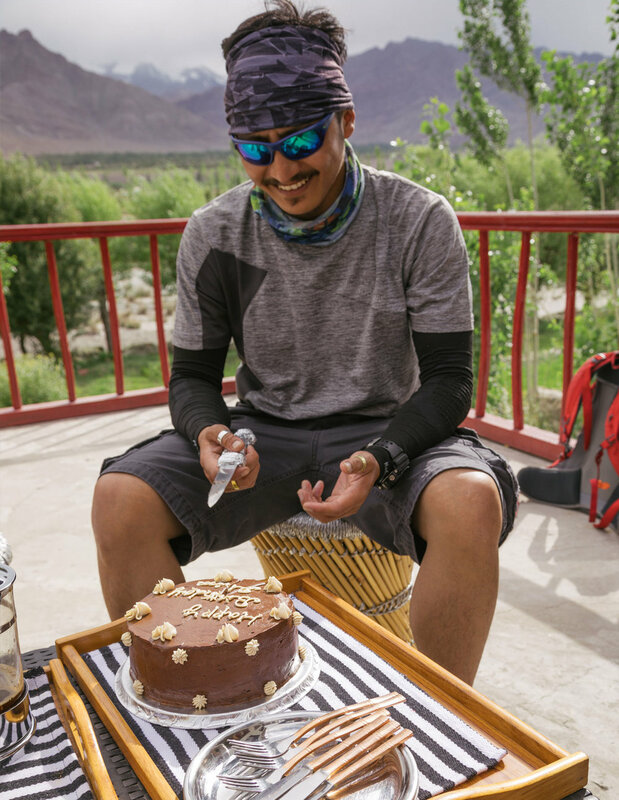 The final three nights of our amazing trip to Ladakh were spent at the River House, aptly named due to the river that flowed at the bottom of the organic vegetable garden. Our room afforded the most wonderful views of Stakna Monastery. The local family that owned the house were a joy and happy to share a snippet of their life with us. One morning we set off at 5:45am to the 14th Century Thiksey Monastery, which sits majestically on a hill. Climbing to the roof terrace we waited patiently for two monks from the yellow hat sect (the same as followed by His Holiness the Dalai Lama) to appear. Raising copper dungkar conch shells to their lips, they broke the dawn silence with a resounding call to prayer for their fellow monks of the monastery. We then witnessed the morning prayers. Bit by bit the monks entered the prayer room, sat down and began to chant mantras. It was a mesmerising sight like nothing we had witnessed before and we left uplifted by what we had seen. Our time in Ladakh left us struck by the epic beauty of the landscape and uniqueness of the culture. Whilst staying in the homes of Ladakhi people gave us a rare chance to experience an unchanged rural way of life. But going back to the title of this piece. After everything we had witnessed in Ladakh, there was one final amazing experience. As we stood on the roadside in Shey village amongst a throng of local Ladakhi’s, many in local dress, we watched a procession of vehicles pass by. Then we caught a glimpse through the tinted windows of his vehicle. A wave and a smile from His Holiness the Dalai Lama. This was a sighting we never thought we would see in our wildest dreams. It left us speechless, but honoured we had witnessed it with local people as opposed to tourists, to whom we could plainly see it meant even more to. 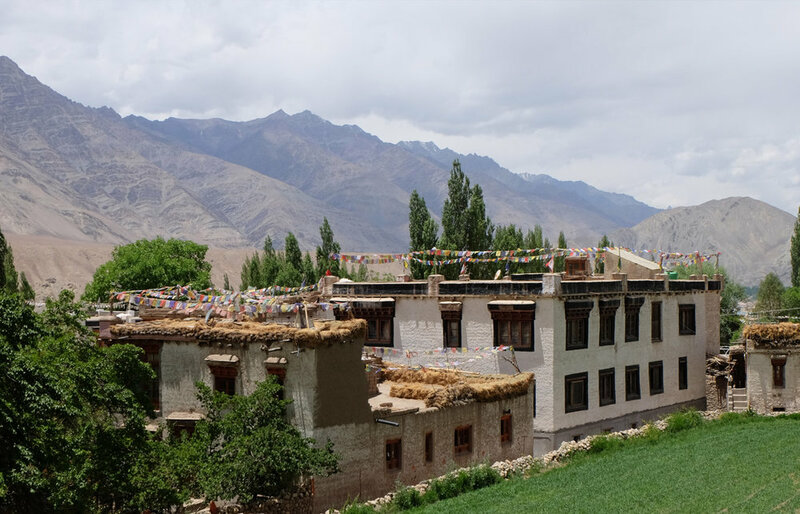 If you are interested in the village experience in Ladakh, staying in wonderfully comfortable traditional houses, then please do get in touch. I am also happy to discuss trips to other parts of India, which is one of my favourite countries.